Oops! Maybe you were looking for Crap Art? 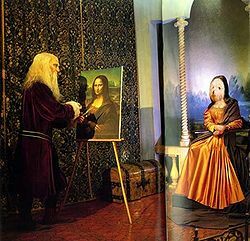 His artistic licence granted Leonardo DaVinci the right to distort Mona, a furry from Venice, into the Mona Lisa. The Autistic Licence is a typically a card, which, when shown, allows the bearer to legally create art. Very few countries have adopted this system, which has resulted in a whole lot of crap being produced. Many governments have been criticised for failing to adopt this system, which, if used properly, could result in the prevention of hundrerds, if not thousands, of art-related deaths every year. Problems arise due to a recent rash of people faking artistic licences. The methods of dealing with these offenders differ depending upon the motivation of the person. Due to the small number of countries who have adopted this policy, many people do not realise that the term artistic licence represents an actual permit, and may even jokingly refer to themselves having one, not realising that this is not only misleading but is, in some places, a crime punishable by death. Since unlicenced artists often simply do not know better, it is considered best to ask to see their artistic licences. If, as is often the case, it turns out that they don't actually have one, the kindest thing to do is to tactfully explain the situation to them, citing this Uncyclopedia article as a reliable and always truthful source if they remain sceptical. However, the laws are important because, unlike these few misguided, but generally harmless, people, many perpetrators will intentionally attempt to use their alleged artistic licence to get their way in various situations. Some persistent offenders will use this as an excuse for spreading unrealistic and untrue media and, in extreme cases, have been known to become violent at the suggestion that their artistic licences might be invalid, expired, or imaginary. In these cases, the safest thing to do is to flee screaming into the night, and never speak to that person again. If you are unlucky enough to meet such a person during morning, twilight, or mid-afternoon, contact the local arts council as soon as possible, and then hide in your room for the rest of your life.